What I have seen and spent what seems to be a lifetime fighting, is corrupt town halls pandering to greedy developers, fast bucks, palms greased, with result every town looks the same, the same corporate chains dominate the town centre, the same corporate chains find in every ghastly shopping centre. This neither brings in visitors nor is popular with locals who see familiar landmarks destroyed, lose their sense of place, money is drained out of the local economy, then large chains close, go bust, expanded on debt, leaving behind desolation, as we have seen with BHS, House of Fraser, Debenhams and many other zombie companies kept afloat by their banks. Corrupt town planners who have not a clue what constitutes good town centre planning or how local economies function love big development. Big development lots of money sloshing around, some of which finds its way into the wrong pockets. A few examples illustrates failure of good town centre design and planning. Sincil Street runs parallel to the High Street in Lincoln. A street of Victorian buildings, local indie businesses, or was. Up until a few years ago, Sincil Street between the hours of ten in the morning and four in the afternoon was busier than the High Street, the High Street the same corporate chains find anywhere and everywhere. Now Sincil Street is being destroyed, the local council acting in cahoots with the local coop, local businesses driven out, chains brought in, Victorian building destroyed. Enter the picture Lincoln BIG and Visit Lincoln. Both are hyping the chains, it gets worse Visit Lincoln being paid to do so. Many towns now have businesses development groups, accountable to no one, act for and controlled by big businesses, not one vote per business, based upon the size of local business tax. Experience Guildford employs Town Rangers, no one knows what purpose they serve other than to deliver a glossy A4 newssheet to local businesses which goes straight in the bin. They also subsidise the town centre car parks at Christmas, the one time of the year when the car parks are full to overflowing. Ask any local businesses what is killing them. High rents, high local business taxes. The local coop owns the properties hikes the rents, Lincoln BIG exacts a levy on top of the local business taxes. Local businesses see no benefits. Visit Lincoln masquerades as a tourism body, acts as a quasi-PR agency, is paid to hype the corporate chains moving into and destroying the character of Sincil Street. Fake-Left Guardian had an article describing the dire state of Sheffield. The local council responded with eight tweets, big development taking place, corporate chains listed, same chains find anywhere. The same Sheffield City Council that destroyed thousands if not tens of thousands of street trees, harassed and criminalised protesters. Empty two-coach Northern Fail train Lincoln to Sheffield, hour and twenty minutes only starts to fill as nears Sheffield passing through small towns like Worksop, making the point, not worth visiting for corporate chains find anywhere. One of the chains mentioned, 200 Degrees, a small coffee chain serving mediocre coffee, the same chain hyped by Visit Lincoln and Lincoln BIG. Oh the irony, when Sheffield has a thriving coffee scene and 200 Degrees empty. In Sheffield Union St, coffee shop, co-working space, pop up kitchen, community hub located in an occupied building, Now Then, an interesting magazine, supported by local community and local businesses, published by a not-for-profit. Farnborough destroyed half its town centre for a superstore, an estate of social houses surrounded a grassy green destroyed for the car park. A 17th century inn destroyed for a drive-thru McDonald’s. Wastegate, chain eateries and a superstore on the edge of Aldershot town centre, destroyed the town centre now boarded-up retail units and the chain eateries pulling out from Wastegate. In the centre of Guildford Tunsgate Quarter, a sterile shopping centre, boarded-up units, same crap cooperate chains find in every ghastly shopping centre across the country, devoid of people. The only use, provides a handy short cut. One of the crap corporate chains Cosy Club, a fake 1930s bar, so fake a Monty Python parody of fake, Visit Guildford promoted on twitter over a dozen times. Contrast with North Laine in Brighton, three long streets, similar Victorian street scene as Sincil Street in Lincoln, local indie businesses, butcher, baker cheesemonger, bookshops, music shops, coffee shops, restaurants, worker coops, not a chain in sight, always busy. When all places look the same they become soul destroying, we lose our sense of place, alienation sets in. We need to green our cities, protect our existing green spaces. In Farnborough they are destroying the remaining green space for development, in Sheffield tens of thousands of street trees have been cut down. City centres should be pedestrianised, delivery vehicles park on the periphery, deliver by hand cart and trolley. Cities generate data, the data should be used as a common good. Citizens may consent to access to their data receiving benefits in return, the data randomised and made available to local businesses. Citizens need to seize control of their local Town Halls, open to public participation, network with other citizen-controlled Town Halls. No more one party states. There is not a conflict with locals and tourists. There is only conflict when lose businesses serving locals and replace with businesses selling overpriced tourist tat, when AirBnB moves in, rents are hiked, but that is a problem of over-tourism lack of regulation, rather than tourism per se. At the time of the English Civil War, the Diggers asked the question: who owns the space? The space they were asking of was land, who owns the land? They saw God created Man and Woman as equal, the land was owned by everyone and no one, it was a common wealth. The question is as pertinent today. Who owns the space, who owns the public parks, public space, the empty buildings, the data we generate? Space is not static, something to be owned. It is dynamic, only has meaning if used, lived on, shared, enjoyed. Derelict buildings we must occupy, put to use on behalf of the community, fight the loss of community space. Trinity Market, a recently refurbished Edwardian market, 1902 the oldest covered market in Hull. Stripped back exposing the iron columns and girders, open and airy. They have attempted to create something like Borough Market in London, artisan food and other independent traders. Contrast with grim failing markets elsewhere, too often destroyed for redvelopement. Contrast with Central Market off Sincil Street in Lincoln. Grim an understatement, Coop and the City Council have done their damnedest to destroy the market and the surrounding area. Empty stalls, trash, one of the few stalls worth visiting a spice stall, closed at the weekend. Trinity Market shows what could be if local councils had vision. Develop for local quality businesses, not as Lincoln, destroy an area, invite in chains. It was in Trinity Market I found Caffeinated, as the name implies, a coffee stall. One area of Trinity Market has bench seats. An area to sit and relax and enjoy the food on offer. As I was leaving, a noticed a stage being set up, therefore I assume live music in the evening. My last visit to International Bomber Command Centre, muddy approach, shell of a building, hard hat, steel-tipped boots, hi-vis vests for access. Today, a loose gravel approach to the finished building. Not yet officially open, today was to give the media a glimpse. Walking in, after passing through an open plan reception, a large auditorium, large screen, various interactive and static displays. The interactive displays, students dressed the part, speaking what it was like, based upon recorded first hand accounts. The interactive displays in the prison cells in the old Victorian Prison in Lincoln Castle give an idea of what to expect. For the Centre, to collect these first hand accounts, was literally a race against time. Since the first hand accounts were collected, of people in their nineties, a third of those who gave these first hand accounts are sadly no longer with us. The static displays, a pair of flying boots, a lamp, playing cards. The playing cards, on each card, hand written account of a bombing raid. Dominating the room a large display. On the large screen, bombing targets lit up. At first I thought, not many, that was until I noticed a scrolling bar. What was being shown was nightly raids, night by night. A warning, a film was to be shown, almost like warning of an air raid. Was this a warning to evacuate the room? Maybe. Then I could see why so loud, when an Avro Lancaster took off, then the bombs dropped, then a building on fire, then footage from the air of the destroyed buildings, presumably taken by the Germans, then the lost people wandering the streets. I was privileged to be able to watch this in a room on my own, well almost on my own, a BBC film crew and one veteran of WWII Bomber Command. The impact would not have been the same in a room full of people. To describe as emotional would be an understatement. I later congratulated the Centre Director Nicky Barr and said she should she be very proud of what she has created. She said that even though she had created, the first time she watched, it was a very emotive experience. There are other smaller rooms, including dining room, with coffee, San Remo espresso machine and associated kitchen. Not today, but when up and running, will be serving a special blend of coffee and tea created for the Centre by Stokes. They will also have on sale bags of the coffee and tea. The Centre is not only a visitor centre, it will also be a research centre with archive material. The Centre tells the story from all sides, the crew on the ground, the aircrew, and the Germans who were bombed. What is the point some may say. Syria. Look what Assad has done to Syria, bombed-out buildings, the only way he can retain control of Syria is to kill his own people, aided and abetted by Vladimir Putin. Yemen. Corrupt House of Saud carrying out genocide in Yemen, weapons supplied courtesy of British arms companies. Heritage Open Day is when buildings not normally open are open to the public, or with the example of Lincoln Cathedral, the entrance fee is waived. There was though something extra. A guided walk following the route of The Battle of Lincoln. I would have participated yesterday. Heavy rain put paid. I caught the end of the walk opposite Norman House on Steep Hill. I apologised for not joining the walk and learnt there would be a repeat on Sunday. Thus I was outside The Museum of Lincolnshire Life for an interesting walk. As we finished up outside the Visitor Information Centre, to see if they had anything useful on The Battle of Lincoln, they do not, apart from 1217 The Battle of Lincoln, a Ladybird-style book aimed at children. I did though find a collection of miniature knights. These were used by the artists to show what their full-sized Knight would look like. What will happen to these I do not know. They should be given permanent exhibition space somewhere. It was unfortunate the Knights were removed last week. A huge mistake. Typical bureaucratic thinking. They have proved to be highly popular and should have remained in the street until at least the end of September, if not longer. I picked up a programme for the Lincoln Book Festival. Small, with emphasis on quality. Contrast with the Guildford Book Festival, large with the emphasis on hyped authors. I would love to go to the talk on Mona Lisa. After the walk, I wandered to Stokes Lawn Café. A mistake, I should have walked down Steep Hill to Makushi. It was then through the Castle Grounds, visit the Castle Shop, which is worth a visit. Usually such places house tourist tat. Lincoln castle must be the exception. I have never visited before. Worth a visit. I picked up a copy Magna Carta by David Starkey. I am no great fan of his, but this was the best book on display. I wanted it, not only for Magna Carta, but also the life of King John. A bad King. He was forced by the Barons to sign, strictly speaking, place his seal on Magna Carta. What most do not realise, it was almost immediately reneged upon, annulled by The Pope, a French Invasion followed, and led on his death to the decisive Battle of Lincoln, the route I had just followed. Appalling the amount of damage caused by Graduation in the Castle Grounds last week. It had been cold and windy all afternoon, now rain. I headed for Lincoln Cathedral. 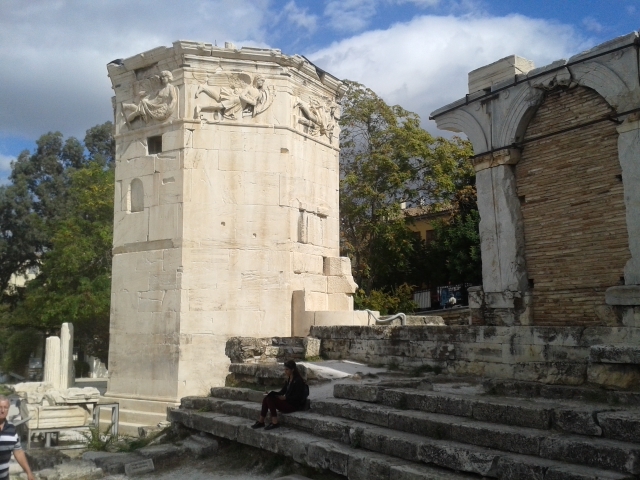 The Tower of the Winds or the Horologion of Andronikos Kyrrhestes is an octagonal Pentelic marble clock tower within the Roman Agora in Athens that functioned as a horologion or clock. The structure features or did a combination of sundials, a water clock, and a wind vane. It was supposedly built by Andronicus of Cyrrhus around 50 BC, but according to other sources, might have been constructed in the 2nd century BC before the rest of the forum. The water clock may have taken the form of a waterwheel. The roof is a series of triangular slabs locked in place by a circular keystone. Around the periphery is represented the eight winds. 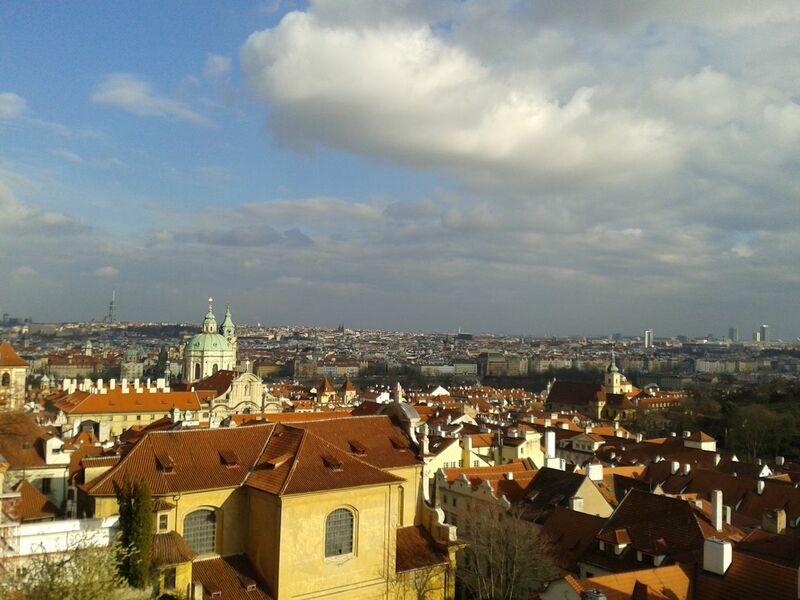 Prague Castle, seen from across the river, dominates the skyline, especially Saint Vitus Cathedral and Lobkowicz Palace. 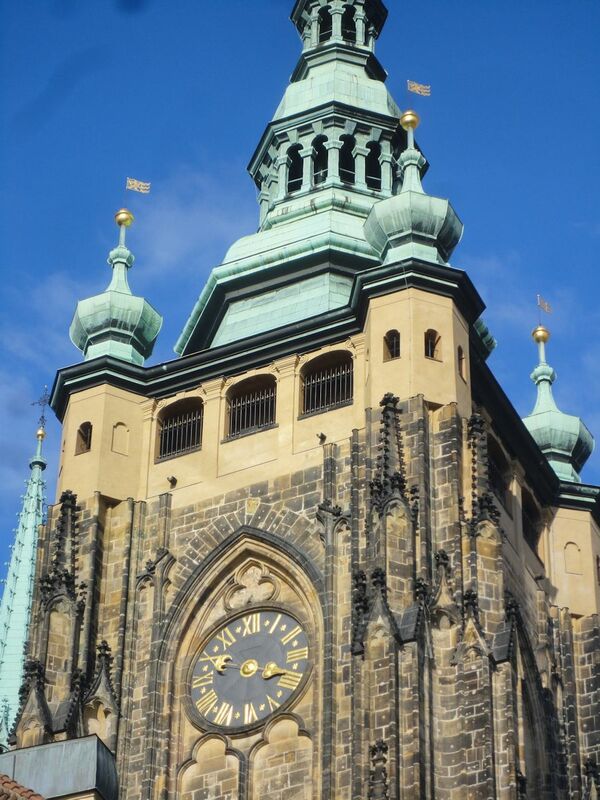 Saint Vitus Cathedral is situated within the Prague Castle complex. To pay to walk around inside, but can enter the main doors and enjoy the stunning view looking down the nave. Had I paid, I would have learnt contains the tombs of many Bohemian kings and Holy Roman Emperors. Two key features are the figures on the main doors and above the doors, and the clocks. 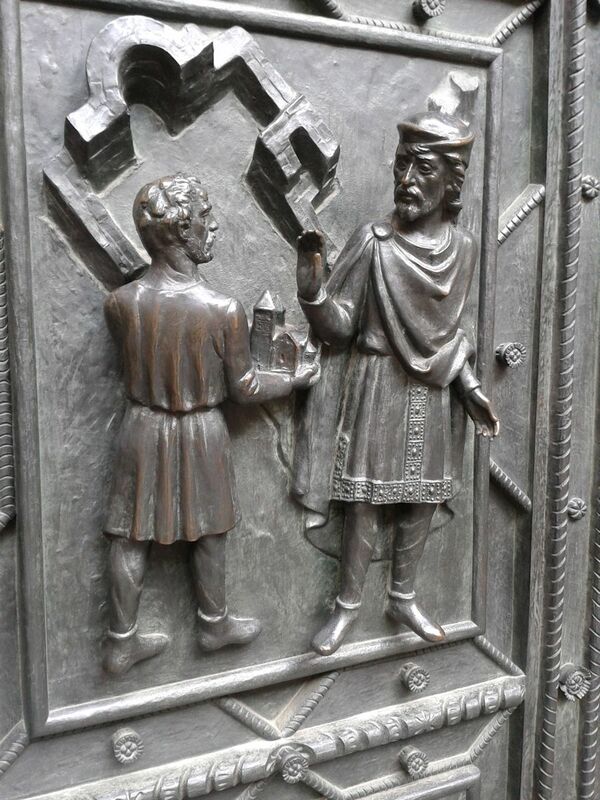 The figures on the doors, cast in metal, are amazing. I was puzzled by the clocks, why one above the other? Why two clocks? The time was such, they both appeared to be showing the same time. It was only after observing over a period of several minutes, I realised one was showing the hour, the other the minutes. No 22 tram took me up to Prague Castle. Novel way of paying. Pay for time not distance. Ticket has to be bought in advance from a machine. I alighted at the right palace and wandered in. Police and soldiers on guard with semi-automatic rifles. 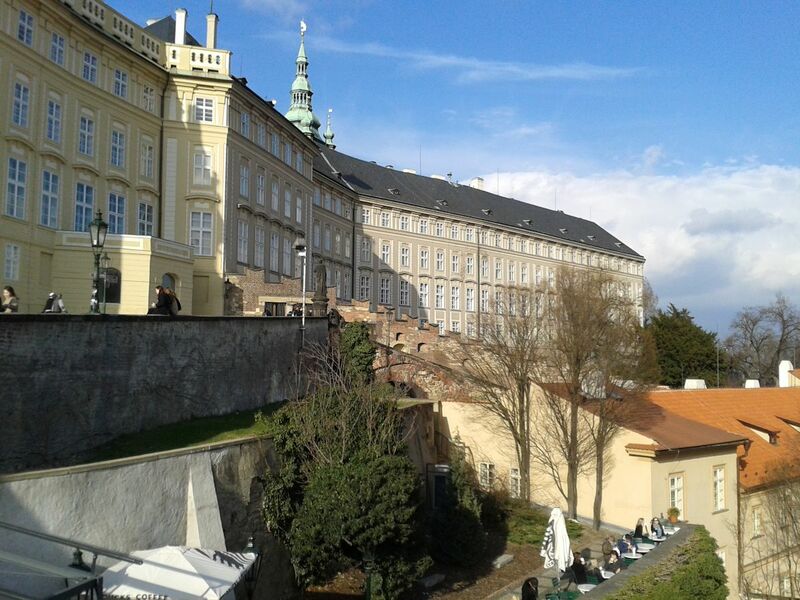 Prague Castle is a castle complex, many streets and buildings including churches, Saint Vitus Cathedral, museums, monasteries and palaces, including Lobkowicz Palace. 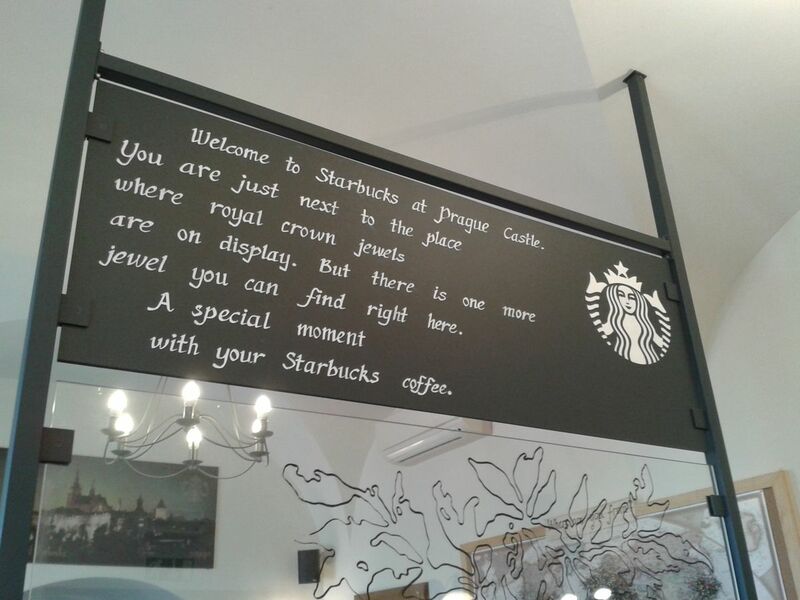 Prague Castle, the location with the most stunning view over Prague, occupied by Starbucks. A grass terrace, a spiral stone staircase. They were even queuing. 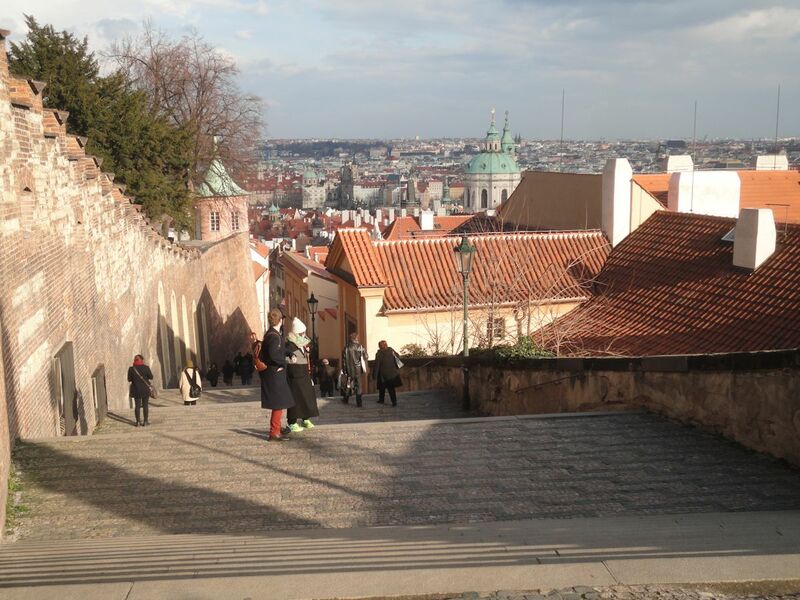 Steps lead down from Prague Castle.